Today was my first trip to The Tobacco Hut in a couple weeks. Last Saturday I was in Boston on business and later visiting with my brothers-in-law. The business part of the trip was awesome - I learned a lot and met some fantastic people. Yes, Joe, you'll get your cigar next week! Paula flew up at the end of the week and we hung out with her brothers and family, did some touristy stuff exploring Boston and just enjoyed a long, relaxing weekend. I visited L.J. Peretti's, a tobacconist located near Boston Common. It's been around for 130 years and is a full service smoke shop. The store is crammed full of pipes, cigars, tobacco, and accessories. The help was a little crusty, but that just added to the charm of the place. 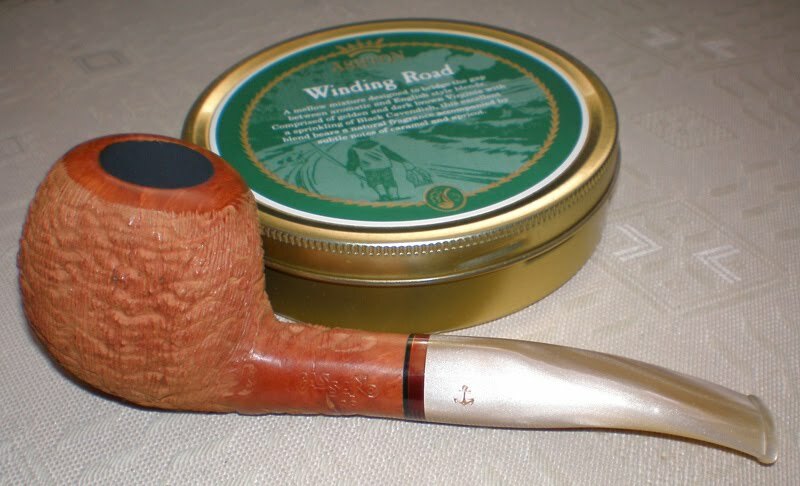 I picked up a tan sandblasted Cassano pipe while there (see above). I had never heard of the brand, but apparently it is fairly well-regarded, although it's not too well known in the U.S. They use 100-year-old oil-cured briar, designed to be easy to break in. I definitely found that to be true as I simply loaded up the bowl with some Frog Morton and lit up. It smoked like a champ from top to bottom, producing a nice, gray ash with very little unburned bits of tobacco. Here's a picture I snapped of it shortly before its inaugural smoke. We had the usual folks at the Hut today: Joe K, Peter G, Lou (of course), and myself. We also had a new customer come in, Ed, who seemed like quite a nice fellow. By the way, I like the word "fellow" and I'm not happy that it's fallen out of common usage. "Guy" is so pedestrian. I'd like to bring back "fellow" similar to how Peter is doing his part to bring back the fedora. Speaking of which, we saw Peter with his fedora a couple weeks ago, but not today. Bring back the fedora! Topics of discussion included how displeased Joe is with our President, but I refused to debate with him, no matter how much he's been drinking the Fox News Kool-Aid. We also discussed the almost-perfect game thrown by Detroit's Armando Gallaraga a couple nights ago and whether umpire Jim Joyce's bad call should be overturned. We were all, like most people, in favor of keeping the call, however bad, intact. Lou was under the impression that it's been twenty years between this year's two perfect games and previous ones, but Peter and I corrected him. Just for the record, here are the years that the sport's twenty perfect games have been pitched: 1880(2), 1904, 1908, 1922, 1956, 1964, 1965, 1968, 1981, 1984, 1988, 1991, 1994, 1998, 1999, 2004, 2009, 2010(2). Lou must have been remembering the 34-year gap between 1922 & 1956, the longest gap between perfect games. Another dispute came up about whether former President Bill Clinton has a navy vessel named after him. Our cigar-smoking host thought there was, but Peter and I didn't think so. After I got home, I checked the Dictionary of American Naval Fighting Ships. There are two USS Clintons, neither was named after our cigar - um, smoking, President. The first was a tugboat commissioned in 1864 and served until 1870 in New York and Norfolk. The second USS Clinton was commissioned in February 1945 and served as a troop transport ship, earning a single battle star for service in WWII. It was decommissioned and scrapped in 1958. And with that, today's history lesson is over. Hope to see everyone at the Hut next Saturday. Hey Bob great blog. I can almost hear Lou's cash register while I read it. It sounds like Joe was about to break his own rule about no politics spoken. My last order contained two cigars free. I framed the invoice and hung it on the wall. An Open Letter to "Tim"